I Quit – The benefit of quitting. How was 2016 for you? For me, it was a year of a lot of personal growth. Super excited as I am working towards serving you and thus making this world a better place for everyone. The whole idea of Joyous Expansion is to raise the vibration of the people who are in contact with me so that they can raise the vibration of the people in their lives. Will cause the vibration in their lives to rise. The better you are doing, the better the people around you are doing. Humans are social creatures, and that is how I am doing my part in making this world a better place. 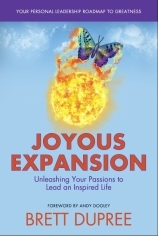 With that, I am excited to announce a whole new Joyous Expansion Transformation System. A way to best utilize my abilities to help you live the life of your dreams. I would love to serve you and help you make your dreams a reality. Check out my redesigned website and course, http://JoyousExpansion.com. If you know anyone who has a passion and is letting fear and doubt get in their way, share my page with them. I would love to have a conversation to see how I can help them. It is now 2017. A new time to create new memories and take advantage of new opportunities. Do you have a theme? Mine is deliberate action! The deliberate action I take, the better I will be at serving this world. I wish you all the luck in the world, all the success in the world and all the love in the world. Let’s rock 2017! Woo hoo!